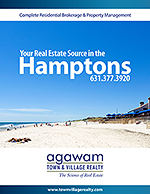 The following are items that may, or may not, apply to any real estate purchase one makes on the East End of Long Island in the Town of Southampton (Remsenburg through Sagaponack) and in the Town of East Hampton (Wainscott through Montauk). CPF (Peconic Region) Real Estate Transfer Tax: 2% of the first $250,000 (East Hampton, Southampton, Shelter Island) or $150,000 (Riverhead, Southold) of the purchase price of a house or building ($100,000/$75,000 for unimproved land) is exempt from real estate transfer fee. On a $1,000,000 purchase, the buyer pays $15,000/$17,000 to the Community Preservation Fund, Peconic Region on the purchase of a home or building. On a $500,000 land purchase, the buyer pays $8,000/$8,500. Title Insurance Premiums (average): The buyer pays approximately $675 forthe first $100,000; $190 for each additional $50,000 up to $500,000; $3.75 for each $1,000 between $501,000-$1,000,000 (i.e. on $1,000,000 purchase, the buyer pays approximately $4,070 for Title Insurance.) When purchase is financed by a lending institution, additional insurance is often required. Survey Fees: The buyer is responsible for the cost(s) of a survey. If it is supplied by the seller, that is at no charge. Additions or alterations to an existing survey can vary in price. Appraisal Fees: The appraiser is working for your financial institution or mortgage broker. They will order the necessary appraisal(s); the costs vary (based greatly on the size and value of the property), and are passed on to you at the time of closing. Legal Fees: These fees can be either hourly or flat fee. For names and numbers of local attorneys, I can guide and help you. Adjustments: For instance, the oil in the tank, pro-rated real estate taxes, etc. are as per negotiated between buyer and seller.